The past 8 days have been a roller coaster. I came down with the flu last Saturday and have been pretty out of it ever since. Thankfully, I am beginning to feel like myself again, albeit slowly. Nevertheless, it has been an exciting week in the fishing world. First, the 2011 Bassmaster Classic kicked off in the Louisiana Delta on Friday. As of now, it looks like Kevin VanDam will win his 4th classic and second in a row. The man is an absolute machine when it comes to catching fish...incredible! He is an amazing fisherman by any standard. I have been tuning in to the Classic's live blog since Friday...sometimes to the chagrin of Mary May. Last Friday was also the day I got my GoPro Hero HD action sports camera in the mail. This thing is so small and light, yet takes amazing video and photos. Plus it has a waterproof case that is built like a tank. We messed around with it a little this week, but I can not wait to try it on the water! The next bit of good news came from my fellow RippinLip Outdoors Pro Staffers. Bill Kohls, another bass fisherman from here in NC, took 2nd place on Belews Lake this weekend in a Bass Open. I don't have full details yet, but I know 37 boats entered the tourney and Belews is a power plant lake, so it has some warmer water. I also know that Bill, like me, loves to crank, so I bet more than a few of his fish came on cranks. Congrats to Bill and check out RippinLip Outdoors for a full story. Early last week I also got a chance to check out the RiverBassin Tournament Trail for 2011. All I can say is...WOW. This is going to be bigger and better than ever and should make for an awesome year! I know I will be fishing in the Charlotte tournament on April 2nd and am hoping to make it to more. Finally, I got some good news from Great Outdoor Provision Company this week. They have 3 new Coosas in stock at the Raleigh store. One is blue, one is tan, and the other I am not sure about. I know they have been selling like hotcakes, so if you are interested, stop by the GOPC location in Raleigh (Cameron Village) or give them a call at (919) 833-1741. You can also demo a Coosa from them for a day, which is always a nice perk before buying. And of course, if anyone reading this wants to try out a Coosa just drop me a message and you can paddle mine. I hope to get out on the water by the end of the week and really hope I will have some video footage from the GoPro as well. Until then...tight lines! In the end I caught about 60-70 fish and brought home a stringer of about 10 crappie, which made for a delicious dinner! Tight lines! When winter really starts to set in, which is typically January in North Carolina, fishing changes significantly. 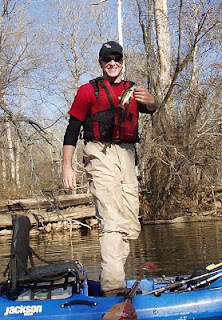 Air and water temperatuers drop and many fish, such as bass, start to get less active. Others, like crappie, school up and can often be more aggressive. Lakes and rivers become much different fisheries and even your local farm pond may require some different tactics to pull out a few bass. Over the past two and half weeks I made 3 trips on different bodies of water and had luck each time catching bass. This blog will give some short details of each trip and give some tips for anyone out there trying to get a few winter bites. My first trip was to Falls Lake, NC. A friend of mine, Jun, who is in my department at Duke has been wanting to go fishing. So, he decided to give kayak fishing a try and we headed out in very cold temperatures. At launch, the air temp was 25 degrees and the wind was blowing pretty hard. We met up with two other guys and set out in search of fish. I knew the river channel would be the place to target, but the lake was down 6-8 feet and the wind made it tough to set-up where I wanted. So I moved to a spot I had found on my electronics last year. I was seeing large schools of bait and some feeding activity, so we started fishing there. A short time later, I hooked up with a solid 14" bass and Jun landed one right around 15". After catching a few large shad, we called it a short day as water was freezing everywhere - including my waders, jacket, rods, reels, kayak deck, and fingers. For me, this day was a case of 1) using your electronics - which I feel is very important in the winter & 2) knowing when to quit - which sometimes you just gotta do for your own safety and sanity. 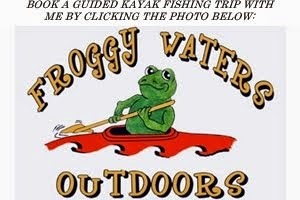 My second trip was with my friend Gary (froggy waters) Ribet. Gary wanted to hit a small lake in Orange County. I promised to not reveal the name, but it is a public lake. We went out in search of anything that was willing to bite. We checked out the river channel, deep drops, rock banks, and just about any place would could think of, but we couldn't find good schools of fish. The only pattern I noticed on my electronics was that the fish were very spread out chasing schools of shad. We managed to catch 5-6 largemouths, 3-4 crappie, a yellow perch, and a bream between us, but all were fairly small. It was one of those days that makes you realize just how different winter patterns are and how important it is to be patient in the winter. Even though we were fishing areas that hold lots of fish during the majority of the year, the winter pattern had pushed fish elsewhere, most likely to the upper end of the lake where a river flows in (a 5+ mile paddle that we didn't make) and to very deep water (50+ feet). On a late January afternoon, even an 8 inch spotted bass can make you smile! My third trip was with Mary May. We decided to hit a local river and catch some spotted bass. It took a little while, but we eventually figured them out and caught quite a few fish using spinnerbaits and crankbaits. However, even in a smaller ecosystem, such as a river, bass want to find warmer, deeper, slower water. One side of the river looked amazing with slow pools, logs, and rock ledges, but we couldn't buy a bite there. The other side, which looked good, but to a lesser degree, had fish in every small pool. So sometimes, just a degree or two warmer water can be a key. Oh, and my Jackson Coosa continued to impress! I hope others are out there enjoying the winter fishing, whether it be on open water down south or through the ice up north! Until next time, tight lines!